Thankfully, Feral Friends and Cat Matchers have come to our rescue, actually, to the rescue of these little furry creatures! They have helped me trap, neuter or spay, doctor and vaccinate, as well as re-home when possible, over a dozen feral cats - so far! We aren't done yet, as we know of at least 2 more to go. It seems new ones show up periodically. Cats are wonderful, cute and very helpful at a farm - but - do you know how many litters a single female cat can have in just one year? So, I wanted to help keep this situation from getting out of control, and basically, just feeding the coyote population as too many cats means territories get spread out away from the relative safety of houses, garages and barns. Additionally, too many cats means a flea outbreak each summer, cat fights among un-neutered male cats and a whole lot of hungry and sick cats that can't be taken care of correctly. 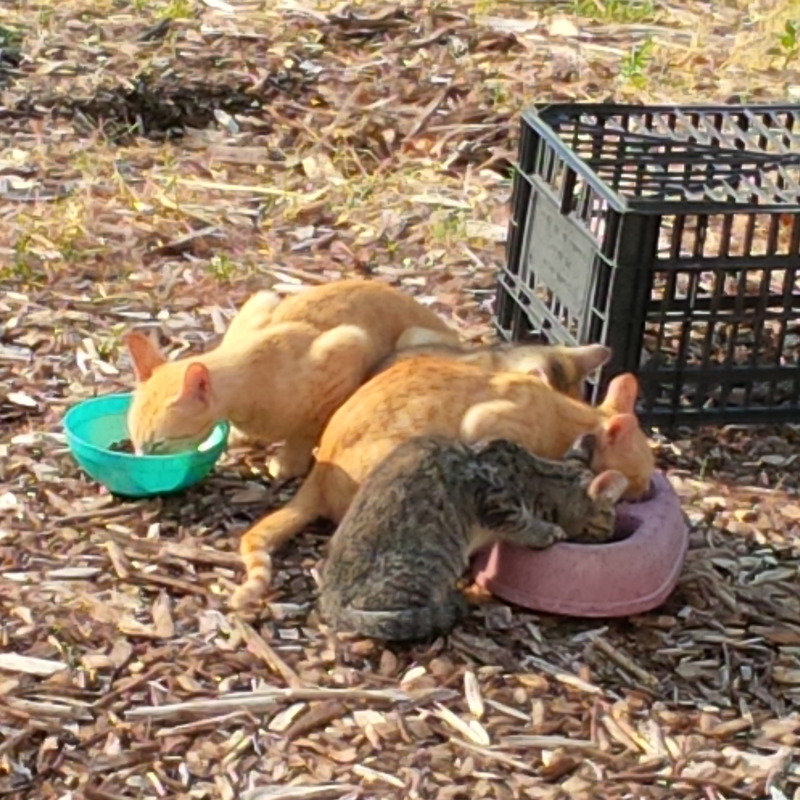 To help support us here at Eden's with the feral community at the farm for feed, flea meds and ongoing care - please click "donate" button above. The farm is NOT a 501C3, so this is just a gift because you love kitties, and not tax deductable. To make a straight, tax deductible donation to either other organization, please click on organization name links above. Teaching others about small local farming and personal nutrition is one of our passions here at Eden's. We feel that education is important in helping people strive to live healthier more fully independent lives. Bring your group to Eden's Garden CSA Farm for an educational farm tour experience and learn about sustainable farming/gardening, food preparation, farm animals' place on the farm, take a scenic walk to see our honey bees, and stay for a special extended unit on honey bees or earthworms (Extra unit optional.). One of our farmers will guide you around the farm for an interactive tour. Get up close with chickens, roosters, sheep, livestock guard dogs and horses; observe a working farm with guided tour of the gardens, bee hives, chicken coops, and horse barn. Pack a picnic lunch and eat under the old oak trees and enjoy an afternoon away from the city - just down the road.